We’re proud to announce that Exceptional Dental has been named a Top 50 Workplace in New Orleans. This is an achievement we’re truly proud of, not because of what it says about us as a company, but because of what it says about the environment we’ve created together. Our employees are committed to making this a great place to work for others. Exceptional Dental knows that creating a great workplace starts with hiring the right people. So, we’re selective about who we hire. We focus on hiring only the best available talent in the dental industry. As a result, the work that is being done at Exceptional Dental locations is….well, exceptional. Once per year, Exceptional Dental’s offices close to the public so that we can perform dental work on our employees if they are in need. We’ve found that often our employees need or want work done, but continually get bumped in favor of other patients, so we’ve decided to set a day aside that is just for them. We’ve done this because we want our employees to know they’re important. It’s a great chance to bond and to take a little break to appreciate the work we do for others. At Exceptional Dental, we offer competitive pay and benefits to all employees. That’s because we recognize the value of good, hard-working, employees. We want to keep the talent that makes us work. And that means putting our money where our mouth is. We also go to great lengths to ensure that our offices are pleasant places to work. That might seem like an obvious statement, but it’s more work than you’d think. Every job can be frustrating sometimes, but we work hard to enjoy that our offices remain friendly environments. Are you looking to work in the dental field? Exceptional Dental could be the right place for you. 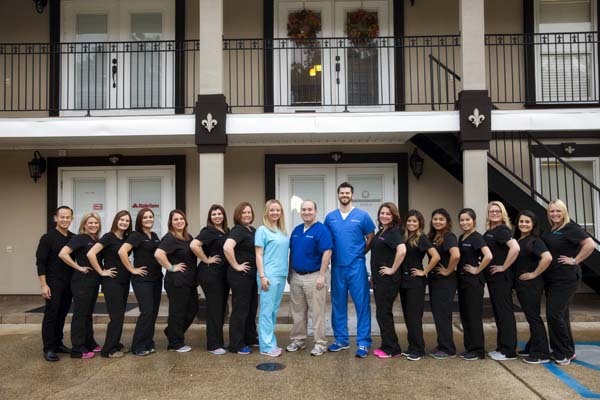 As a Top 50 Workplace in New Orleans, we’re proud to attract the best dental talent in the crescent city.